Just because there’s no snow around doesn’t mean that you can’t experience the thrill of skiing. When the snow melts and the slopes close, ski enthusiasts can take up roller skiing. It’s a thrilling equivalent to the classic winter sport, making it possible for competitive athletes to train during the off-season and enthusiasts to take up the sport in warmer climates. Roller skiing provides a similar experience and requires the same skill and athletic prowess as snow skiing. While it’s not an easy sport by any means, it is a unique activity that will provide a number of great benefits for beginners. However, picking up the sport can be daunting. The main issue novices will face is deciding what type of gear to get. There are two different types of rollers skis available, each dictating ski style and experience. Both types of skis feature a similar fundamental design, but small differences make all the difference. New skiers can choose to go with classic or skate style roller skis. Before hitting the pavement, it’s important to decide which type of roller ski is best for your specific style, needs, and skill level. 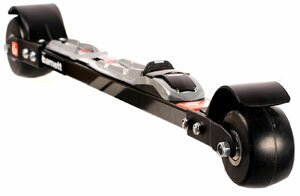 Skate-style roller skis are designed specifically for the new sport. While they can be used for traditional snow training, these skates are adapted from older designs to accommodate the growing sport and modern competitions. They feature a shorter shaft and thinner wheels similar to roller blades. Different types of wheels are utilized for roller skiing on rough surfaces like gravel or smoother surfaces like pavement. These roller skis are used differently than classic options. Athletes will use a unique skate technique that provides more freedom than traditional skiing. The technique is more versatile and imitates skating. Here are two great skate roller skis for beginners. These roller skis from Swenor are designed to provide a realistic experience that rivals snow. The shaft is made from multiple layers of materials. The core is comprised of layered wood. This lightens vibrations from the road for a more comfortable experience. The wood is wrapped in carbon fiber and fiberglass. This creates rigidity and durability. The result is a flexible shaft that’s capable of withstanding the rigors of a hard surface. The skis include medium-speed wheels that are protected with splash guards for use on any surface. These roller skis feature a shaft made from 100% carbon. This material is very lightweight and flexible enough to imitate the feeling of real snow skiing. However, it’s also tough for improved longevity and performance. The large wheels are attached with monoblock aluminum alloy forks. This helps with control and also reduces the transfer of vibrations from the road, creating a genuine skiing experience. Classic roller skis are identified by their longer shafts and wider wheels. 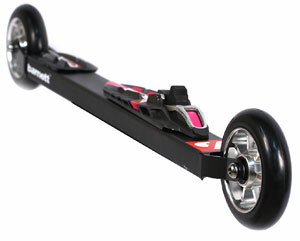 The wide wheels are noticeably smaller than skate roller skis and have a ratchet to provide a bit of kick. Typically, classic roller skis are better for simulating snow skiing. It develops core and arm strength to build up endurance in the snow. Ratchet system also imitates grip on the slope. However, the added kick can throw off snow training because it’s easier with roller skis. 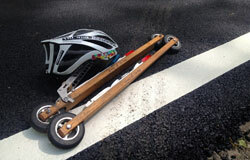 Overall, classic roller skis are more stable and realistic, making them a suitable option for newbies. Here are two of the best classic roller skis available. This classic variant from Swenor has a similar composite shaft as the skate-style counterpart. It features layers of light wood, epoxy resin, carbon fiber, and fiberglass. It’s flexible for more control but tough enough to last for many rides. It designed for hard smooth surfaces and uses soft rubber wheels that can absorb the vibrations of the road. Both wheels are protected from dirt, debris, and water with splash guards. The roller skis come fully installed with Rottefella bindings. This pair of roller skis are designed specifically for young novice athletes. It can help to improve snow ski technique and has a low profile that mimics the feeling of gliding down a slope. The shaft is made from an aluminum alloy for durability. An aluminum alloy monoblock is used for the forks. To help with propulsion and kick, the skis have a back wheel that doesn’t move. Furthermore, the front wheel only moves forward to prevent backsliding on a climb. Combi roller skis are aptly named because they combine the best of both classic and skate styles. They look like a shorter version of classic roller skis and can be used by athletes that like to perform both styles. With that being said, they’re not perfect for either style. Roller skiers must sacrifice a bit. They don’t angle well like skate roller skis during a climb and require an additional guide to prevent catching on the ground during a classic glide. It’s recommended that new skiers stay away from combi options until they’re comfortable enough with classic and skate techniques. 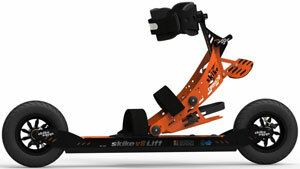 These versatile roller skis from Skike have a number of features that will help athletes of any style. 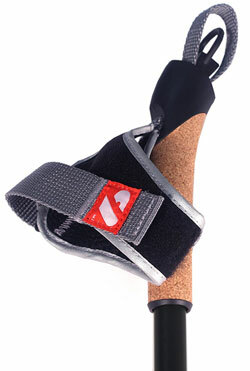 The bindings are made to accommodate any type of boot or even a standard shoe. 6-inch wheels are used. They’re inflatable and can be used on virtually any type of terrain. The air also adds a bit of cushion underfoot for a smoother ride. For added safety, both roller skis have emergency brakes that can help slow you down and come to a safe stop. The skis also come with complementary carbon-composite poles. What Other Equipment is Needed? Once you’ve decided which style of roller ski to go with, there are a few other things to consider. The sport requires a number of different types of equipment. Additional pieces of gear are very similar to snow skiing but help to enhance the experience while improving performance and safety. Roller skis use boots just like standard snow skis. In fact, modern roller skis make it possible for athletes to train with the same boot as their snow skis. However, roller skiing can be harder on equipment. Because of this, it’s recommended to get dedicated boots for roller skiing. Many manufacturers make boots with more ventilation to keep you cool while still supporting the foot and ankle. 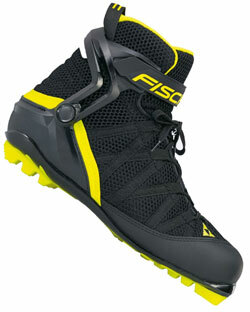 It’s important to get boots that are specifically designed for the type of roller ski chosen and binding used. Bindings are an integral part of skiing and keep your foot in place while you speed down a slope. The same principle applies to roller skiing. They keep the boot attached to the ski. There are specific types of bindings to accommodate skate or classic bindings. The type of ski also determines where the binding is placed. Skate bindings are typically placed in the center of the shaft while classic bindings are pushed back a bit and closer to the ground. Poles will provide you with control and speed. Obviously, traditional snow baskets used on the slopes won’t cut it. They’ll become damaged regardless of the terrain you’re on. The snow baskets should be switched out with roller ski ferrules. These tips can be switched out pretty easily and are comprised of tough materials designed for the hard ground, like carbide. Roller Skiing doesn’t have the luxury of soft snow. It’s vital that you wear appropriate safety gear to avoid serious injury. Helmets are the most important piece of gear to wear. Generally, a standard bike helmet will suffice. They feature a tough outer shell and a softer cushion inside to reduce the force of impact. Gloves and skin protection are also a must. Falls often result in significant sliding. Protection on the hands and arms will prevent abrasive damage. 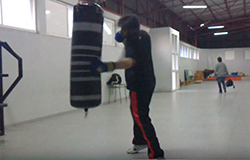 It’s important, however, to ensure that the gloves don’t cover the wrists and inhibit movement. While the sport is great in terms of fitness and training, it’s inherently dangerous. New skiers especially need to take extra precautions to avoid injury. First and foremost, always wear safety equipment. Failure to do so can result in serious injuries that will put a halt to your training. Additionally, it’s important to wear the right gear for the technique you’re doing. If you’re performing classic ski techniques, make sure to use a classic roller ski with matching boots and vice versa. It’s also recommended to perform regular maintenance. Regular training will wear down wheels and dull pole tips. Keep your gear in pristine condition to avoid potential issues. Finally, take it easy and don’t go beyond your skills. Always be aware of the trail you’re on. Look for an area that’s clean and doesn’t have traffic. Before attempting some hills, start on a flat surface and get comfortable with the motions. Make sure that you know how to stop and control your speed before going into unfamiliar territory. With these tips in mind, you can roller ski safely with confidence. All in all, the best type of roller ski for beginners depends entirely on technique. Typically, classic skis are easier to learn because they simulate snow skiing and have more stability. However, athletes that have never skied on snow may find skate roller skis easier due to their versatility. Either way, both options provide a fun and enjoyable skiing experience even in the heat of summer.